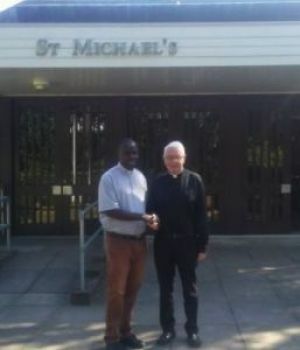 On Father Vitalis’ arrival to the UK, he was warmly welcomed by Father Tony and the parishioners of St Michael’s. While he stayed with the charity’s vice chair Tina Rayburn, he made his way on foot every morning to the church to help with morning mass. A highlight for Father Vitalis was meeting Bishop of Arundel and Brighton, Richard Moth at Cranmore School’s 50th anniversary. Another long term supporter of the charity is St Andrew’s Secondary School Leatherhead and Father Vitalis felt very privileged to be invited to an Action in Africa music night, where the students, along with local primary school pupils, entertained our African visitor, stunning him with their amazing musical talent. 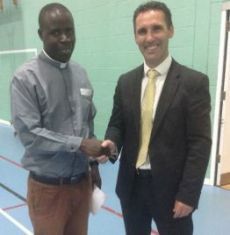 Father Vitalis was thrilled to have the opportunity to meet head Alan Mitchell. 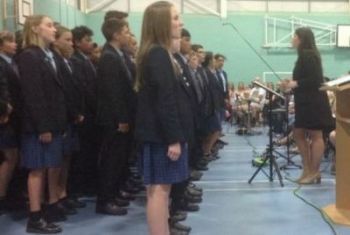 It was so good to be able to thank the school personally for all their fundraising efforts over the years. 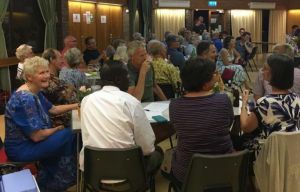 The residents of Ashtead came together to show off their general knowledge at an Action in Africa Quiz Night, held at St Michael’s Church Hall. 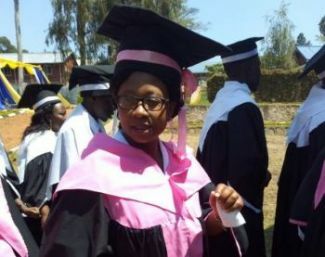 Some of the proceeds raised went towards helping Nyaishozi’s midwife Rebecca Didas through her Master’s degree in midwifery. Rebecca has since graduated and will spend twelve months in the field before she returns to Nyaishozi dispensary full time. This generosity was matched by the parishioners of St Michael’s. 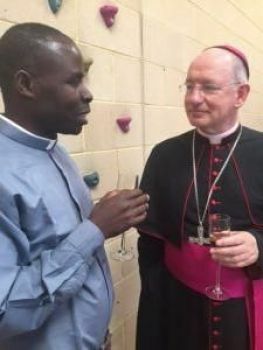 During several pulpit addresses Father Vitalis raised his concern about a community of 17,000 people, scattered over a wide area, who are being serviced by a dispensary that has no form of transport for its nurses and midwives. 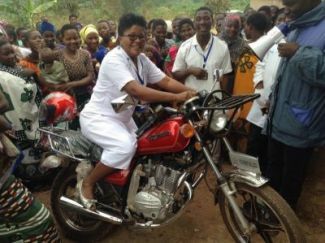 The attending congregations responded in the most kind hearted fashion – donating the majority of the funds needed to buy a Chinese motorbike for Kibogoizi dispensary. Since then, a further two parishioners have come forward, pledging monies to buy two further motorbikes. The first motorbike has already been purchased and delivered to the community dispensary at Kibogoizi. Father Vitalis (centre) with (left to right) Tina Rayburn, Vice Chair, Michael Agius, Chairman, Mary Agius (Michael’s wife) and Carolyn Higgs, Treasurer. We are all donning traditional Africanwear in honour of Father Vitalis presence at the 2018 Quiz Night.